Commercial mobile patrol Vanguard Surveillance and Security - Weston super Mare North Somerset security guards, mobile patrols, key holding & training. Vanguard Surveillance and Security mobile patrols are valuable in the early detection of risks and reporting of incidents which may compromise a business. They also act as a deterrent to criminals observing the area, as patrols are random and therefore unpredictable. The number of patrols are determined by the client; they can be increased at times of high risk ie: local special events, gypsy invasion etc., and decreased when the threat has subsided. Th e mobile patrol consists of a uniformed Security Officer conducting a Footbeat patrol around the property, checking all doors, windows, outbuildings, company vehicles and perimeter are secure. Reporting to client/police any incidents observed or security breaches found, assisting in the processing of emergency procedures at an early stage to avoid the risk of intruder activity and next day business interruption. Upon arrival to the property, the Security Officer will ensure the property is protected by investigating and reporting any alarm activation, intruder light activation, trespassers and any unusual activity in the vicinity of the property. The Security Officer’s duties include the prevention of loss and waste. 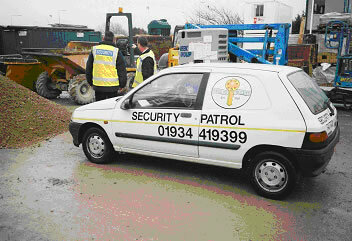 The Security Officer will actively search for, and report, any anomalies found pertaining to the property such as risk of flooding – excess of water – blocked drains or leaking pipes, risks of fire or explosion – smell of gas or burning, strange noises – machinery break down, parts of the property or equipment becoming unstable following adverse weather. Mobile patrols are high profile to act as a visual deterrent. The Mobile patrol Security Officer is provided with a clearly marked patrol vehicle and hi visibility personal protective clothing. Tamper-proof discreet electronic verification equipment is available to clients requiring long term mobile patrols, enabling management to verify the patrols have been conducted, on a daily basis. All clients are provided with high profile security warning signs.